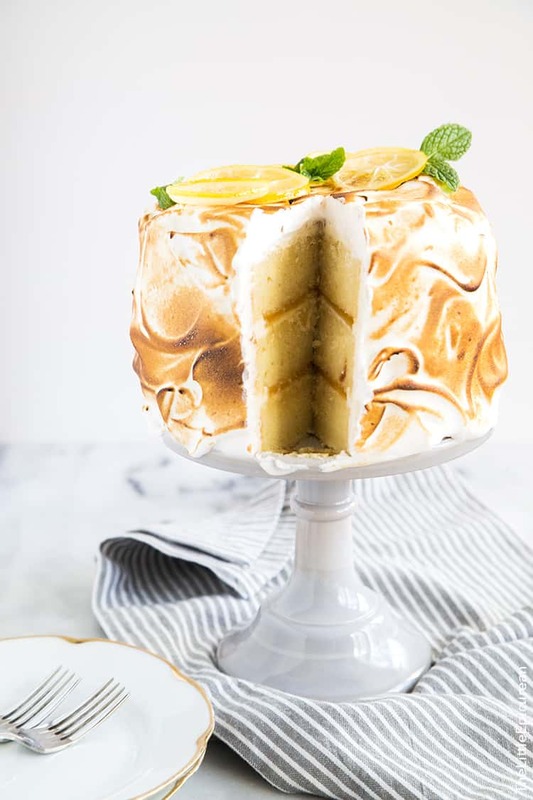 This Lemon Meringue Cake features three layers of lemon buttermilk cake filled with lemon curd and frosted with lemon buttercream. Bad things happen. No matter how good, kind, holy, or perfect you are, bad things can happen to you. Instead of dwelling and wallowing in self pity, pick yourself up and make cake. That seems to work for me. 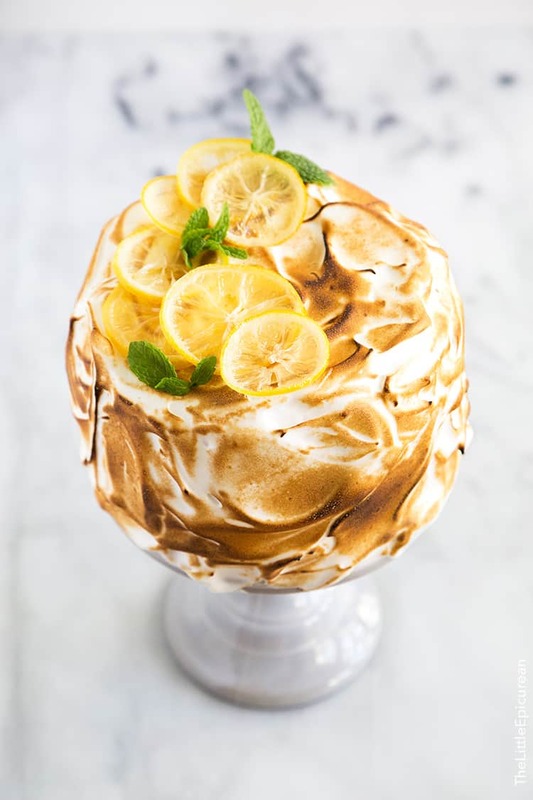 Take all the sour fruits life throws at you and turn it into something sweet and edible like this Lemon Meringue Cake. 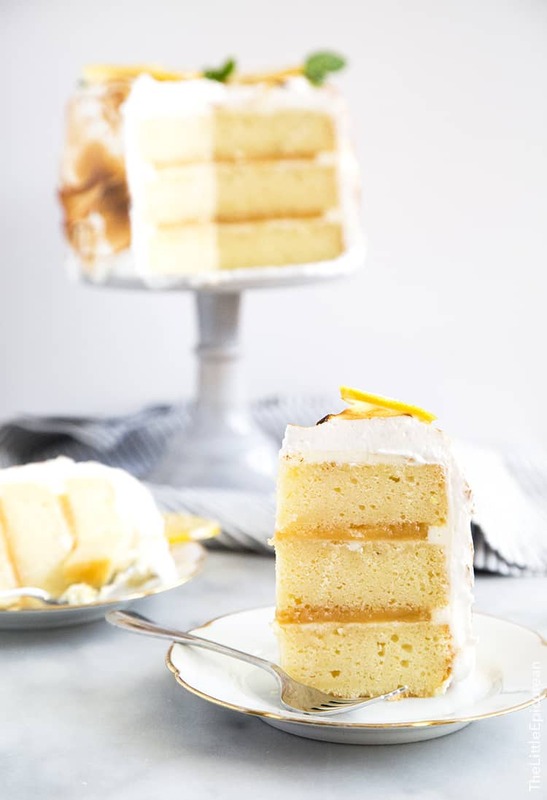 This lovely dessert is made up of three thick layers of lemon buttermilk cake. To prevent the cake from drying out, I lightly soaked it with a boozy lemon syrup during assembly. The cake layers are filled with lemon curd (store bought, because I’m a little nervous of making it myself). And then the cake is frosted with a simple buttercream flavored with quality lemon extract. But, it’s the toasted meringue and the candied lemons that truly makes this lemon cake shine. As unpleasant as it may sound, some foods (and relationships) are better burned. Meringue is sweet on it’s own. Add a little heat and the toasted exterior adds a new world of flavors. No longer is the meringue simply sweet, it becomes complex and delectable. The same can be said for many relationships. Relationships are tested in hot waters during times of anger, despair, deceit, etc. Sometimes they fail horribly, other times they rise from the flames. Anyway, any reason for me to bring out my kitchen torch, is reason enough to brûlée. While this cake is pretty to look at, it needs to be eaten immediately. It’s definitely not one of those cakes that you can display all night on the dessert table. 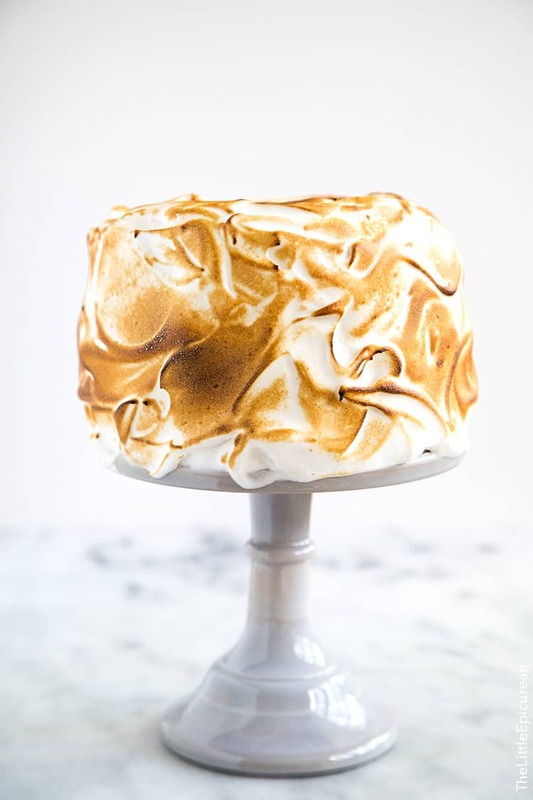 Once you frost it with meringue, the clock starts ticking and it’s time to eat! Believe it or not, I used to hate lemon desserts. I found lemon baked goods tasted eggy or acidic. I couldn’t shake off that metallic flavor I associated with lemon curd. Luckily, over the years (especially thanks to Alex), I’ve come to appreciate all things lemon. Once in a while I’ll stumble upon a terribly eggy lemon bar, but other times I’m surprised by the most amazing lemon cheesecake. Some things take time. Some things require patience. 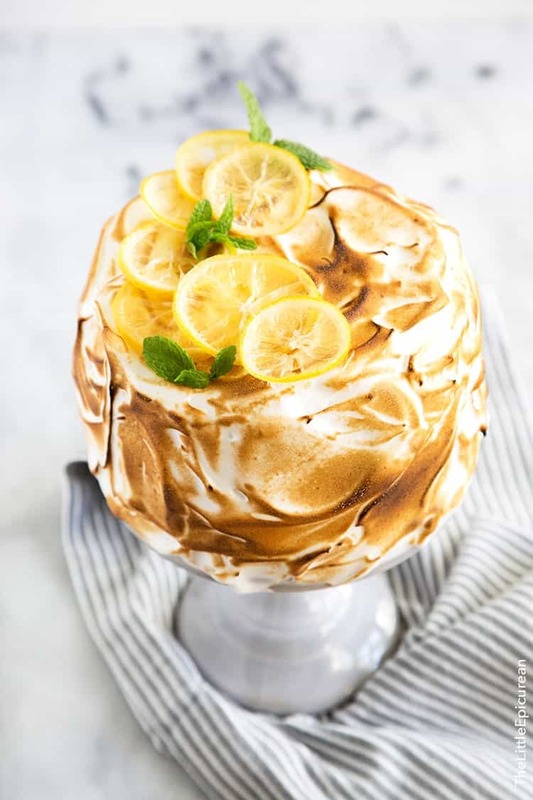 This lemon meringue cake is the perfect bite to ease into lemon flavored sweets. Give it a try! Preheat oven to 350 degrees F. Line three 6-inch round cake pans with parchment paper. Lightly grease and set aside. In the bowl of a stand mixer fitted with a paddle attachment, cream butter. Add sugar and lemon zest whip until smooth. Add eggs and continue to mix on medium speed until incorporated. Scrape down bowl as needed to ensure thorough mixing. Mix milk and lemon juice together. Set aside. Add flour mixture in three additions, alternating with sour milk mixture. Begin and finish with flour mixture. Mix until well incorporated. Divide batter evenly among the three prepared cake pans. Level batter using a mini offset spatula, or the back of a spoon. Bake for 35-40 minutes until a toothpick inserted in center of cake comes out clean. Let cake cool in pan for 5 minutes, then run a mini offset spatula around the cake and unmold. Let cake cool to room temperature on wire rack. Using a handheld mixer or a stand mixer fitted with a paddle attachment, cream butter. Add confectioners' sugar, salt, and lemon extract. Mix until smooth. Set aside. Thinly slice lemon and discard any seeds. In a heavy bottomed skillet, combine sugar, water, and lemon juice. Set over medium heat and cook until sugar has dissolved. Add lemon slices and arrange in a single layer. Reduce heat to a simmer and allow lemon slices to cook until rinds are soft, about 8 minutes. Turn lemon slices occasionally for even cooking. Gently remove candied lemon slices from pan and place on a parchment lined tray to cool. Allow to cool to room temperature. Keep chilled in fridge until ready to use. Reserve lemon sugar syrup. Combined reserved lemon syrup syrup with orange liqueur of choice. Alternatively, you can also use vodka or rum. Apply to cake layers using pastry brush. Meanwhile, in the bowl of a stand mixer fitted with a whisk attachment, beat egg whites and cream of tartar on low speed. Once mixture is foamy, increase speed slightly and whisk to soft peaks. By this time, the sugar syrup should have reached its desired temperature. With the mixer running on medium speed, slowly pour in the hot sugar syrup. Once all the sugar syrup has been added, increase speed and beat until shiny, stiff peaks. Add vanilla and salt and whisk until incorporated. In necessary, level cake layers. Place one cake round on a cake turntable. 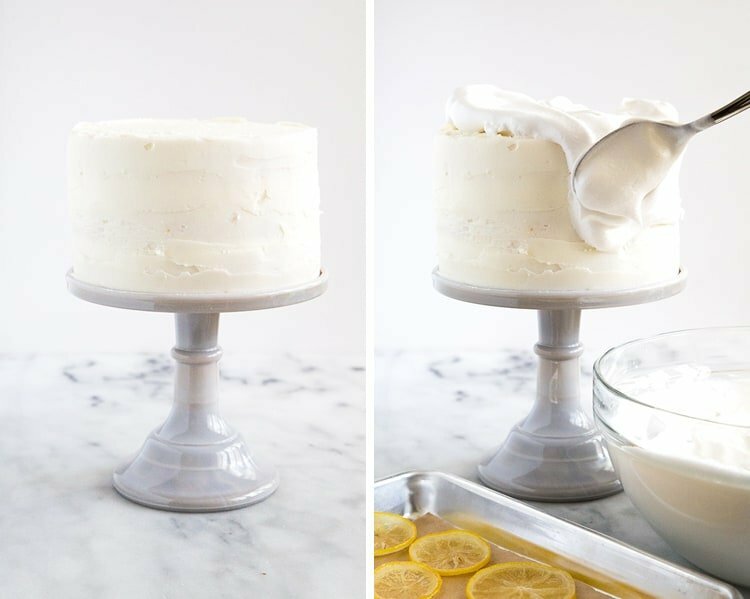 Using a pastry brush, lightly soak cake layer with boozy lemon soaking syrup. Spread a thin layer of buttercream on cake using a small offset spatula. Using the filled piping bag, pipe a small border of buttercream along the perimeter of the cake round. This will serve as a barrier when you add lemon curd. Add enough lemon curd to filled the buttercream boundaries. Spread lemon curd into an even layer. Place second cake layer on top. Repeat adding soaking syrup, filling cake layer with buttercream and lemon curd. Place the final third layer on top. This layer will not be filled with lemon curd. Spread buttercream around the cake to create a "crumb coat" layer to seal in any crumbs. Chill cake in the fridge for 15-20 minutes to set frosting. Add another coat of buttercream and chill for another 15 minutes. Spoon meringue over chilled cake. 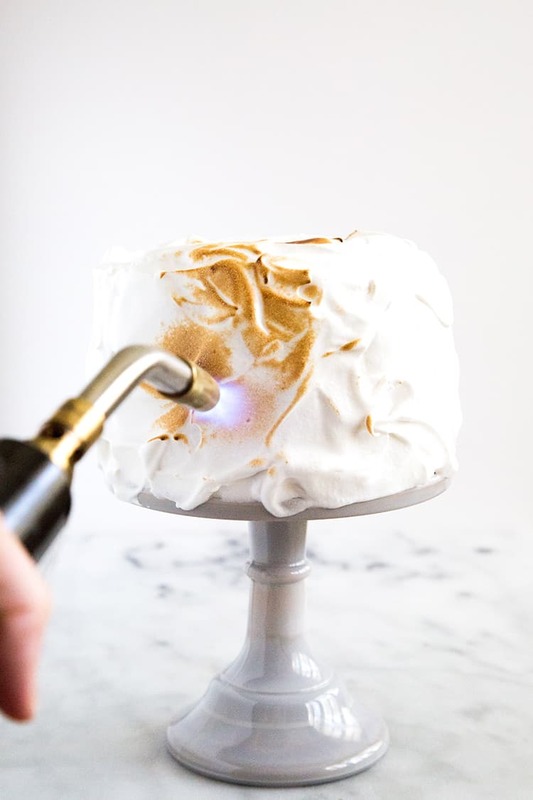 Lightly brown meringue using a kitchen torch. Add candied lemon slices and fresh mint, if desired. Serve immediately. *Note: I use the lemon curd from Trader Joe's. Oh. My. Gosh. This is the cake to end all cakes…seriously, I don’t think it can get much better than this. 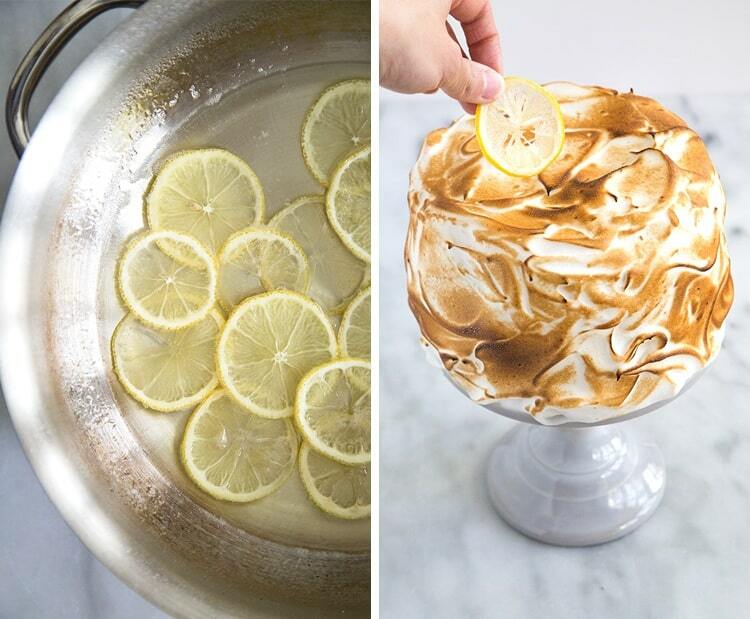 Lemon layers and my weakness (meringue) all around? Sigh…. And I agree, I don’t understand sibling rivalry, either (and I have 3 of them). 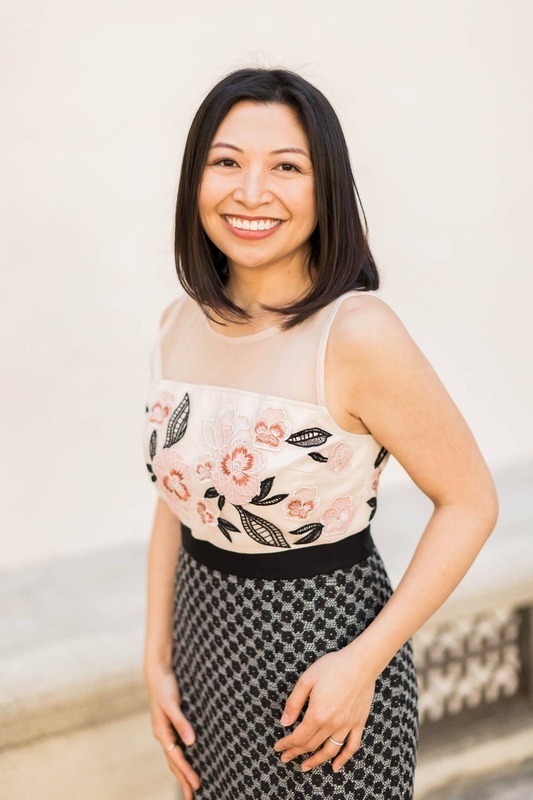 We’re all so different…our own people…each offering different things to different situations, and with different accomplishements. But I ramble, because all I can really think about is a slice of this cake. I’m sold. I need a kitchen torch now. 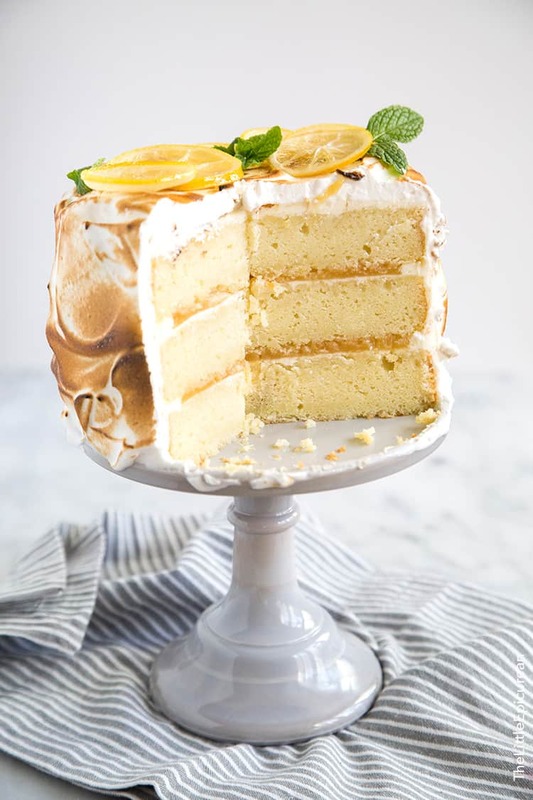 This cake looks absolutely amazing because lemon is one of my favorite flavors! Yes!!! Think of all the things you can brûlée with a kitchen torch! I’m sorry to hear that you are having issues with your sibling. It is never easy. I am struggling to keep a close relationship with my sister (8 years younger than me) as well. Generation gap is definitely one of the reasons. We get along fine when we see each other, but we tend to avoid deep conversation. Hmmm… It is what it is. Hope things will change for the better in the future. For now, I’m glad to see that you are turning the lemons into a sweet cake. It looks stunning with that meringue! Love to have a slice too! What a gorgeous cake! I’m sorry that you seem to be having a hard time with your family. My sister and I are super close and she’s my best friend so I can understand how your heart must be hurting. You are right though, life is too short to surround yourself with people who try to drag you down. Just like a cake surrounded by clouds of sweet meringue, so should you be surrounded by people who enhance your life and bring a lot of sweetness to it! I love this complex, delicious cake. I know it will be a huge hit with my family, and I think this might be my birthday cake of choice this year! The finished product is decorated so beautifully! I am sure using that kitchen torch was quite therapeutic too…. I’m going to have to get me one of those! I was just looking for more excuses to pull out my kitchen torch!!! Yum! I want it all. Sorry about your sibling issues. Yes, you should surround yourself with people who will support and encourage you and not those who will tear you down. This is a gorgeous cake! Would love to try this but I need to buy kitchen torch first. :D Thanks for sharing! You are a MASTER! Amazing. I’m seriously dying! But I see in the ingredient list that you don’t mention the use of sour cream, but it’s mentionned in the “directions”. Can you tell me how much i need to use? Hi Deborah, thank you so much for pointing that out! There is no sour cream in this recipe. I have updated it. Just wondering if you have any ideas about substitutes for the boozy lemon syrup. The cake looks delicious and impressive and I was hoping to make it for my sibling’s birthday. But, he doesn’t drink at all so I can’t use alcohol unless it cooks off. Any ideas on substitutes or ways to make it work sans alcohol? Simply omit the alcohol. Add equal amount water to thin out the lemon syrup.